I had leftover vanilla frosting and whole milk. What to do? Cupcakes for Josh's office! 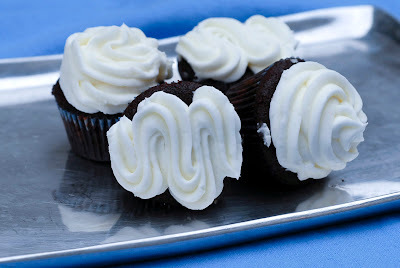 One of my not-so-secret goals is to improve my piping skills so they'll let me frost cupcakes at the bakery. I've gotten to do it a couple of times, but I'm slow and my swirls aren't perfect yet. (I think the ones I do at home look really cute, but you know how each bakery has its own signature style of frosting... My execution isn't totally up to par yet.) 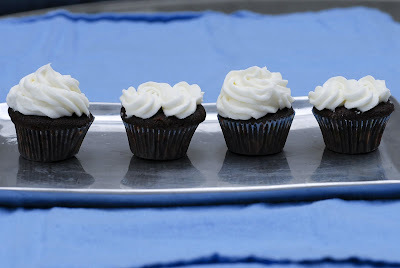 I used Clare Crespo's recipe for mocha cupcakes, and I was surprised how not-coffeeish they tasted. The batter definitely tasted like it, but the cupcakes mostly were just dark (color) with a really light cocoa chocolate taste. They were delicious, however, and I think they'd be great with mocha or chocolate frosting. Or coffee, if you like that sort of thing. Sift together the flour, baking powder, baking soda, salt, and cocoa powder. With the mixer, cream the butter and sugar until they are light and fluffy. Add the egg and beat well. In a small bowl, stir together the milk, coffee, and vanilla. Add the flour and the milk, alternately, to the butter mixture, blending thoroughly. Scoop batter into cupcake liners. Bake approximately 15-19 minutes, or until a tester comes out clean or until the cupcakes spring back when pressed lightly with a finger. I made minis and they took nearly 15 minutes, so I imagine full-size cupcakes would take longer. Cool, then frost with your favorite vanilla, chocolate, coffee, or mocha frosting. I got about 30 minis from this recipe. I don't care for Clare Crespo's recipe. I rarely follow a cookbook, but that new Martha Stewart one is SPOT ON.